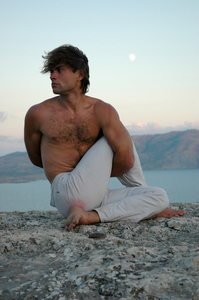 Why is Yoga for Men so Important? Our world is made up of men and women and there are many differences that exist between the sexes. Since primitive times, males have traditionally been the providers and the females have been the nurturers. This fact makes for inherent differences, mainly with males being physically stronger. However, this is a broadly generalized view and there are always exceptions to the rules. This discussion will be kept to the differences between the genders and in no way implies that one is better than the other. Males and females each bring their own gifts that are imperative to life as we know it. These differences make for our uniqueness, not only sexually, but in all aspects of our mind/body constitution. In most males, the body's blueprint is geared towards strength. Their basic muscular and skeletal system is stronger than the female, making the female the fairer and more delicate of the two. The increased muscular strength and higher metabolic rate in men helped in getting through the hardships of early primitive life and the reason for our survival through the ages. Bodies that are bigger need specific training to keep fit. Including yoga into your training routine adds a dimension of fitness not available through any other method. Men who practice yoga benefit tremendously due to yoga's ability to incorporate many aspects of fitness, not only through muscular enhancement, strengthening and flexibility, but through the massage of the internal organs and stress reduction benefits. Unlike in the East, many people here in the West see yoga as a form of exercise for women only, but more men than most people are aware of are beginning to embrace this art. Yoga has the ability to help anyone build strength and flexibility, regardless of gender, but men have more imbalances due to over-development of certain muscle groups. Practicing yoga can help reduce imbalances in muscle development from certain sports that use some muscles more than others. Yoga for men can help prevent over development of regularly used muscles that grow stronger while others are ignored. The tightness and pain caused by muscle imbalance disappears through regular practice of yoga. In today's world it is necessary to be fit in more than just the physical capacity. The demands of society and modern day living now reach far beyond physical endurance and strength. Today's male needs to have resilience and skills in areas never before needed. Requirements for working and living are changing at a rapid pace. Men and women both need the same skills in many areas of the workplace. Women are matching men in many forays of life, which is causing boundary confusion, complications and conflict in relationships. Practicing yoga can get men in touch with the unity consciousness needed for co-creativity. What is learned from practicing yoga is that life is not a competitive sport and this carries through into work and personal relationships making it a win-win lifestyle. Through meditation, yoga brings about mental clarity and stronger emotional foundations, which eventually brings about the ability to control thoughts to the utmost advantage in any situation. Engaging in a daily and consistent yoga practice may be the beginning of a new-found understanding of the innermost self for many men, and the solution to what seems to be a continuous downward spiral from life's harsh realities. More than ever, today's demands on men make it impossible for them to separate true problems that need immediate attention from minor irritations. If the body is in a perpetual fight or flight state, adrenaline overload and the stress and demands on the body cause a complete breakdown over time, physically, mentally and to the immune system. Through the practice of yoga, men can connect in new ways and begin to put things in proper perspective. Not only is there an increase in strength, flexibility and muscle tone, but better balance in the thought process. Fine-tuned awareness begins to develop, allowing for more accurate decision making and less juggling of meaningless, wasted thoughts. Things can be put into their proper places. Nothing gets resolved from worrying. In fact, what we see as problems are usually not really problems at all, only circumstances with new opportunities waiting for us to creatively reap new gifts. Yoga is versatile and easy to practice in a variety of environments. No specialized equipment is necessary and you can vary the intensity of your workout easily. Yoga involves the whole body and makes you feel great all over. It's easy to get a cardio workout with some advanced and intense forms of yoga. Classes are being filled with more men than ever. Once you try yoga, you will most likely love it and be hooked for life. Yoga for Men - Where to Start? If you're interested in yoga for men, reading through this website's many areas will help you understand some of the basics. There are many classes offered in most gyms that are just for beginners. Remember not to get discouraged. If you're used to competitive sports, you will find that yoga is much different. Learning new ways of using your body can take time and everyone progresses at different paces, so don't get discouraged. Your first inclination might be to give up, but stay with it and you'll see amazing results in no time. Most men think that yoga is just for women, but the truth is that men were the ones who developed it thousands of years ago. Yoga for men can be a great opportunity to even out your exercise routine, build strength, gain flexibility, repair and correct structural problems and reduce stress. There is no judgment in a yoga class and everyone focuses on their own body, alignment and progress. From the increased mental clarity, stress reducing benefits, spiritual connection and being able to build a lean, fit body, Yoga for Men Rocks! Once you try it, you just might love it! If you are looking for ways to increase your life's potential, visit Personal Development Planet.com - a site rich in information, with an abundance of inspiration and ways to enhance your personal development.